This panel brings convenient functionality. It will make your manual or automated trading in the Meta Trader terminal more comfortable. This panel allows to hide the Stop Loss and Take Profit levels of your trades. The panel stores these levels in its memory. When the market price reached one of the levels, a trade is simply closed and terminal generates a message indicating that a virtual level was triggered. This feature can be disabled. Trailing SL - when the distance from the current price to the trade opening price is greater than the value of the pips_TRSL parameter, Stop Loss is moved by pips_TRSL. Trailing SL "jumps" - when the position profit in pips is equal to the value of pips_TRSL_1, the Stop Loss level is set to the position opening price (to breakeven). 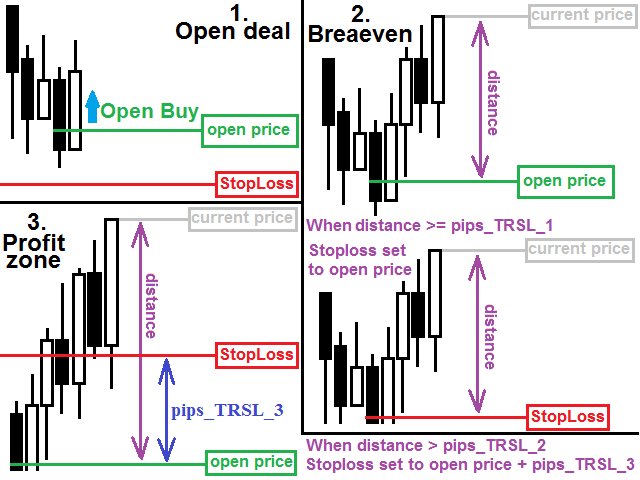 If Stop Loss is at "breakeven" and the distance from the current price to the opening price becomes equal to pips_TRSL_2, the Stop Loss order is moved away from the opening price to fix the profit in pips equal to pips_TRSL_3. This Trailing Stop Loss method is very efficient, it has been tested on different strategies. The algorithm is shows on the screenshot below. need_live_sl_inp- true - if invisible_money_management_inp = true, SL levels are set to the market, located away from the virtual SL by live_sl_point_inp points. color_of_SL - color of the SL line when using virtual SL, TP. color_of_TP - color of the TP line when using virtual SL, TP. need_TP_inp - use Take Profit. I checked this EA only with parameter "Just SL" and TP, I don´t need other functions by now. It works very well in my hedge account, manual or with an EA, for All orders or just for Magic number (1 or more magics openig Virtual_SL_EA in more graphs). It has a good price and works, autor has been very helpful fixing some bug, and similar EAs that I checked were more expensive and had errors. So, 5 stars for Virtual SL/TP is the correct. The only missed thing is a full functional demo just for 1 symbol(CADJPY or other minor), so that we were able of checking its functions before buying it.